This page will contain links that we think are useful for sheltie owner! Lupine Pet -- https://www.lupinepet.com/ -- this is a company where we often get collars and harnesses for our dogs. Their products are well-constructed and are guaranteed for life, even if chewed! We can vouch for this -- when Misty chewed through her step-in harness, we filled out the form on their site, attached a picture of the chewed harness, and they sent out a new one later that day! Great products, and even better, excellent customer service! Canine Connect Dog Sports -- http://www.canineconnectdogsports.com/ -- this is the dog sports center where Misty is training in agility. Awesome people, awesome trainers, high recommend the place! Tail-Waggers Treats by Wendy -- http://tailwaggerstreats.com/ -- these are dog treats made by a local company. Our shelties go nuts over them, especially their ice cream cone treats! 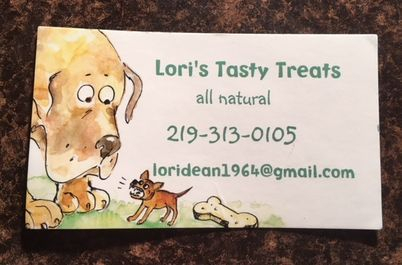 Lori's Tasty Treats -- loridean1964@gmail.com / 219-313-0105 -- Lori is a local woman who sells awesome dog treats. Our shelties go nuts over them! They are all-natural and they smell exactly like their flavors! 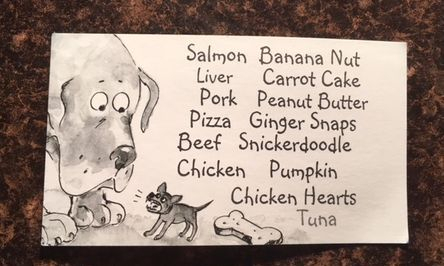 Our dogs' two favorites are the pizza and the snickerdoodle flavors... though there are quite a few flavors available! Companion Dog Sports Program -- www.companiondogsportsprogram.com -- this is a type of obedience-based dog sports... but more fun!